you cant simply just make this a single page? The shrine pictures are gorgeous! @Elena Dal Pra: Thank you for sharing! A very rare photo of Kotohira-gu, a Shinto shrine popularly known as Konpira-san, in Kotohira, Kagawa Prefecture on the island of Shikoku. Few foreign visitors made it to Shikoku during the late 19th century. As tinted photographs were usually produced for and purchased by foreign visitors, it is quite special that such an image exists of this location. 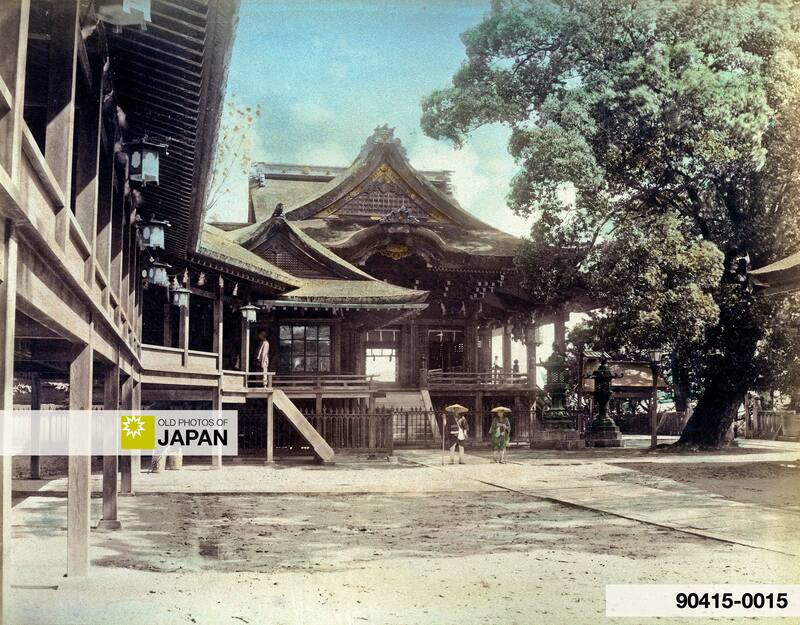 Amazingly, the main shrine building seen on this image—built in 1877 (Meiji 10)—looks virtually exactly the same today. This is one of those relatively few places left in Japan where you can truly jump back into time. Japanese thought quite differently about Shikoku. The island was well-known for the Shikoku Junrei (四国巡礼), a pilgrimage along 88 temples that winds all over the island. It was believed that these temples were visited by the Buddhist monk, and founder of Shingon Buddhism, Kukai (空海, 774–835). Pilgrims basically followed his footsteps. Preferably in the opposite direction, so that during their pilgrimage they may run into the saint. The best English language book ever written about this pilgrimage is Japanese Pilgrimage by Oliver Statler (1985). A number of inns cluster about the station and cater to the hordes of native visitors to the town and its sacred fanes. To reach the latter one turns up at the right and proceeds (5 min.) along the picturesque and cheerful main st. to a converging st. which ascends (right) between lines of balconied inns (Tora-ya, Bizen-ya, etc.) and beneath (in the summer) awnings which impart an Oriental aspect to it. There is a nice background story to this image. Having never visited Kotohira-gu Shrine I was unable to recognize it. Unfortunately, the photo came without any identification. Additionally, it was difficult to determine if this was a shinto shrine or a buddhist temple as the buildings have aspects of both. But when we carefully studied the enlarged scan, my assistant and I were able to make out a Japanese character on one of the buckets parked below the gallery. It was either 金 (kin; money, metal, gold) or 全 (zen; all, whole, complete). So we did an elaborate search for all shrines and temples in Japan featuring either of these characters in their name. 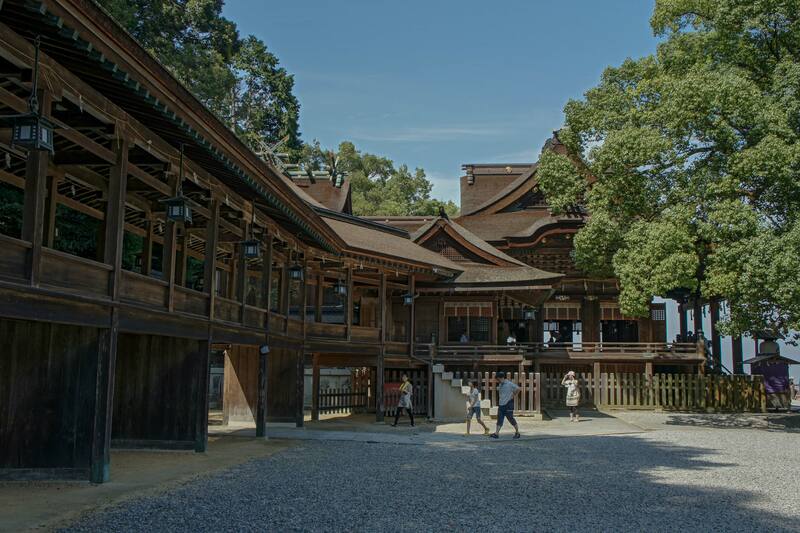 When we eventually checked the photographs of Kotohira-gu Shrine in Kagawa Prefecture, we discovered to our immense surprise and pleasure that it looks pretty much the same today as it did back in the 1880s. We were thereby able to positively identify the location of the image, and even the exact location where the photographer stood (see Google map below). My assistant was so excited, she has now also fallen in love with this quest to discover the what, where and who of these amazing photographs. I hope that you will do so, too! 1 Terry, T Philip, F.R.G.S. (1920). Terry’s Guide to the Japanese Empire. Houghton Mifflin Company, 635. 4 Photo of current situation: ©2010 663highland. You can also licence this image online: 90415-0015 @ MeijiShowa.com. Konpira-gu is the second shrine I have seen in Japan. Since, I have seen dozens, but it is still one of my favorite if not my favorite. Thanks for this great article. We visited this Shrine earlier this year. It is located on the northern part of Shikoku Island. It is a walk to remember. When you get to the top, you know it. This region is also famous for their Udon. We attended an Udon making class at the bottom of the hill, before the climb. It is fun and you get to eat the Udon you make, Japanese style. I will be posting pictures of this climb on my blog. Although the shrine is on top of a hill, it is dedicated to mariner’s who have lost their lives to the sea. It is touching. It is also famous for the many Samurai who have visited there and left their weapons in tribute to those who have lost their lives. The Shrine also looks exactly like it does today as in these pictures from the 1880’s. My wife is from Shikoku and it is off the beaten path. Her hometown of Matsuyama boasts the oldest Onsen in Japan and Dogo Onsen has a seperate private chamber for the Imperial family. Although it has not been visited since Emperor Hirohito. The Onsen proudly has tours of the interior where the Emperor would enjoy the especially hot waters of Dogo Onsen. I forgot to mention, that the Kotohira is home to Japan’s oldest Kabuki theater, still in use. After the climb to the Konpira Shrine, it seems like a walk to find it but it is worth the visit and tour. The tour takes you behind the scenes in a Japanese Kabuki theater. You see how the actors descend upon the stage from above and ascend on the stage from below. Underneath the stage you see the revolving floor and how it works. Definately worth the visit of you seeing the Shrine. @Tony: Thank you for sharing, Tony. I was not aware that Matsuyama boasts the oldest Onsen in Japan, that Dogo Onsen has a seperate private chamber for the Imperial family and that Kotohira is home to Japan’s oldest Kabuki theater. Glad to discover that I’m not too old to learn new things. ^_- I would love to visit the Kabuki theater!